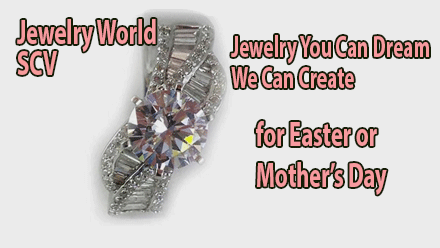 Get Custom Jewelry for Easter or Mother’s Day. Get started on that Special Design today at Jewelry World. You’ll want it ready for any occasion or special day. Very wide price range! Jewelry World has many different options for any person looking Custom 1 of a Kind Jewelry, and if it’s for another special occasion – Jewelry World can help put it all together! We have a wide assortment of gift items that can fill any need for any occasion. Jack can make similar pieces or design something from your imagination. When it comes to this season’s jewelry, it’s Mix and Match time. Come in and get a Great Deals with Free Offer! The SCV community, merchants and non profits are coming together for a complete circle of support.